With the roombox coming together nicely, I decided to create a focal point for the parlor; a mantel with a lighted village scene. This is a very special village scene, created by Sylvia Mobley at Pine Rose Studios. Sylvia does the most spectacular work in porcelain and ceramic clays! As many of you know, I've done a few lighted village scenes in my time (ha ha!). So, I thought I would share how I put them on mantels and add the LED lights. Please forgive the terrible photos that were taken with my phone. I was in a bit of a hurry on Christmas Eve to finish and wrap the project, which was a Christmas gift for my mother. I chose a French Style mantel piece that I felt would fit with the architecture of the roombox. As is often the case, the mantel was not deep enough to accomodate the houses, so I cut a deeper faux mantel top from matboard. White matboard is obviously preferred, but a coat of white paint solved my last-minute materials supply issue! A faux mantel top was created from matboard. 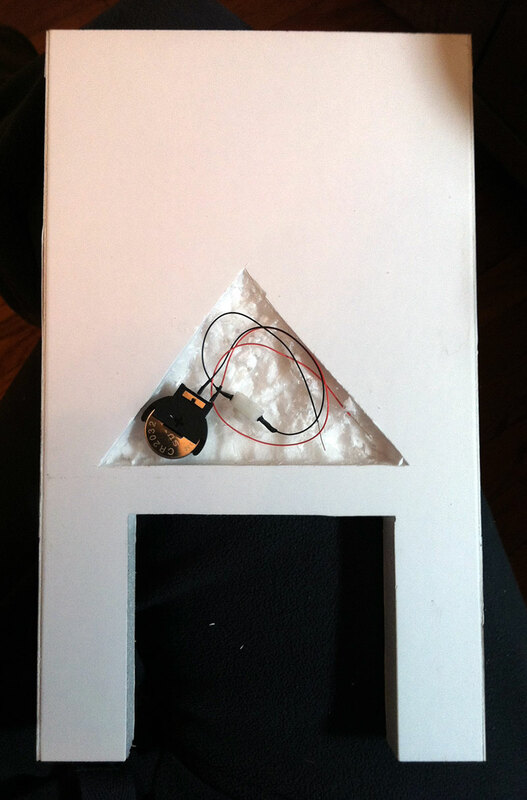 Before I glued the matboard in place, I made tiny holes for the LED wires to slip through, one hole/one LED per house. 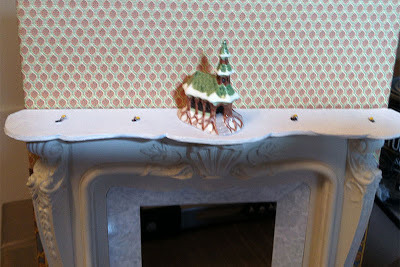 Typically, I glue the LEDs into my paper glitter houses (tutorial) but in this case, I was concerned about gluing them to the porcelain houses. Instead, I bent the wires of the lights flat against the mantel piece and placed the houses on top of each LED (this solution worked well). The wires were pushed through the matboard and bent. They exit the back side of the fireplace under the faux mantel top. 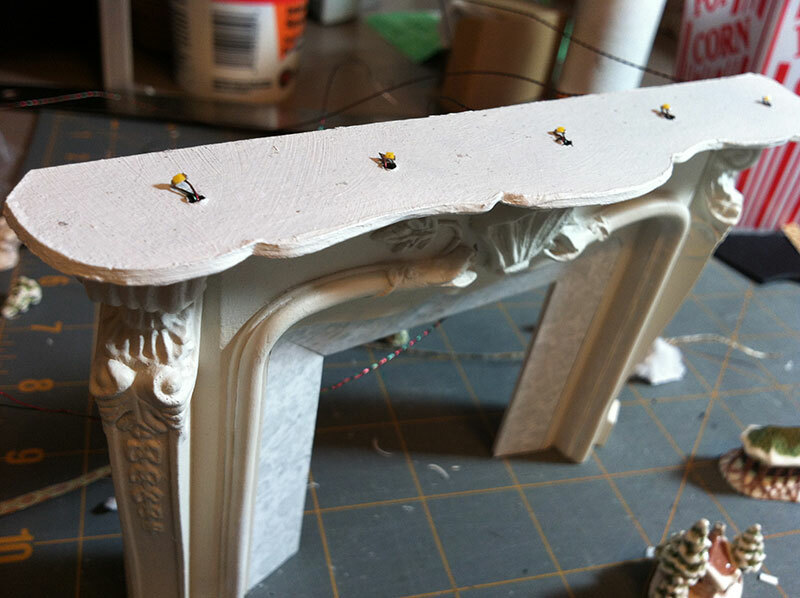 LEDs are placed on top of the faux mantel top. Their wires exit under the top and behind the mantel. 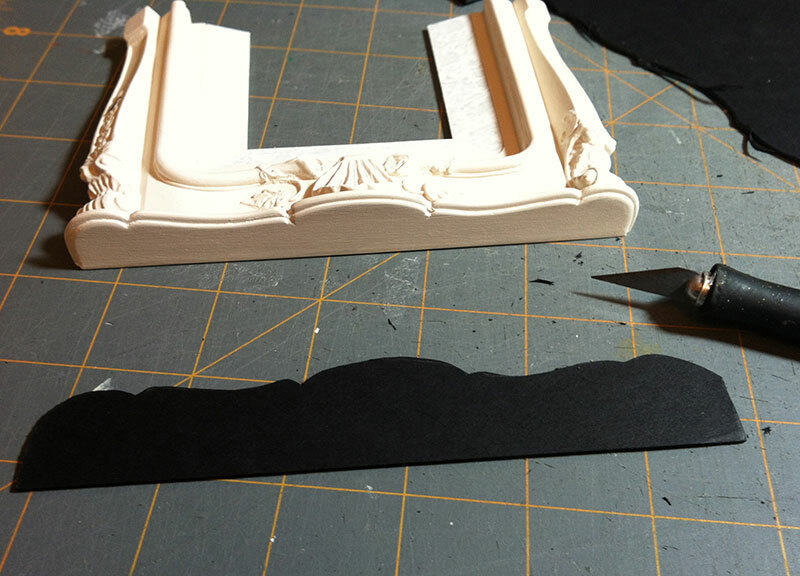 Using foamcore for the chimney breast allows me to carve a section on the back of it for the battery and switch. I wallpapered the front of the chimney breast. Holes were drilled from the front of the chimneybreast (behind the fireplace) into the carved section. The LED wires were pushed through the holes and connected to the battery and switch (tutorial). The back side of the chimney breast. After the wires were pushed through, and the LEDs were tested again, the fireplace and firebox were glued to the chimney breast. The houses were glued on top and the mantel was decorated. A future post will show the completed village scene and the roombox that were finished just in time for Christmas. Well, here it is... just a couple of days before Christmas, and I have yet to finish the indecisive roombox. 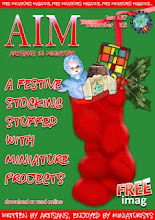 The project has been neglected for a while because I've been busy creating new kits for 2013 (I can't wait to show them!). 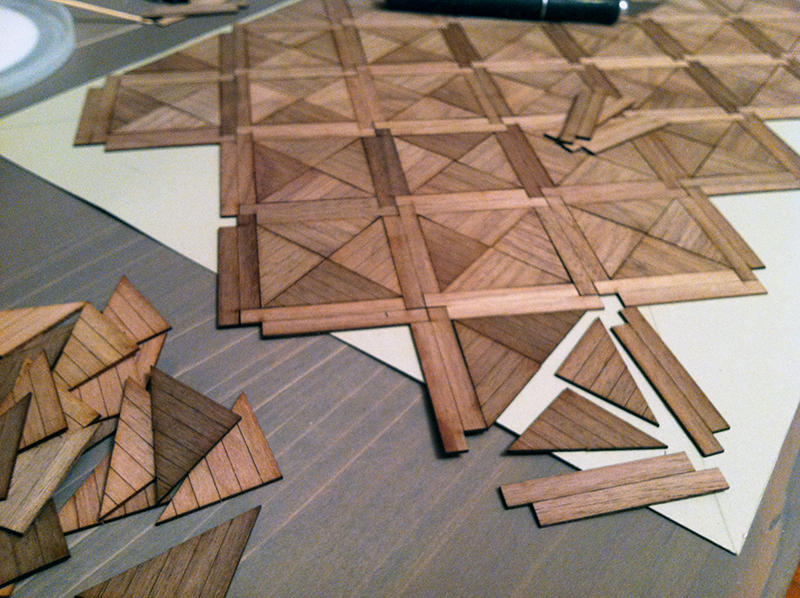 The ceiling was a bit of a challenge because I found out that I don't have the proper tools to cut it. A table saw would have worked perfectly. Are you reading this, Santa? I installed the lighting components from Creative Reproductions 2 Scale, which included a flexible strip of LEDs and a power supply. Using a trick I'd learned from Joe Zerbolio, who teaches really helpful wiring clinics at the Miniature Museum of St. Louis, I mounted the LEDs on a triangle-shape molding and glued the molding to the front of the roombox. 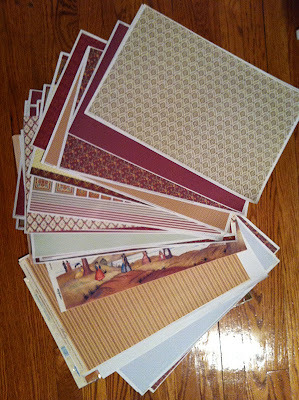 The black walnut flooring kit was purchased from Broadnax Prints. It took a couple of afternoons to assemble the pieces like a puzzle, but it was fun! A coat of dark walnut stain and several coats of a gloss polyurethane will be added. Choosing the wallpapers has proven to be the most difficult job! 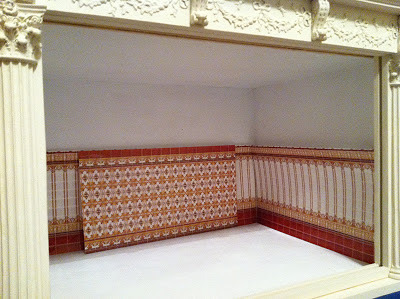 Even though the architecture of the roombox suggests a French style, the wallpapers and furniture will be an assortment of Victorian pieces that were collected by my mother and me for our large Victorian house. Here is a selection of the many, many carpets that were collected over the years. Most of our collection was purchased while my husband and I were still dating. While on a trip to Istanbul, we found these little carpets in all of the tourist shops. 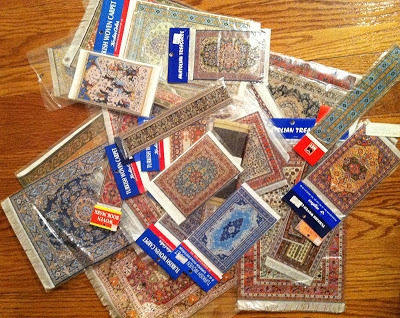 And the fantastic markets offered plenty of opportunities to purchase large quantities of rugs for a discounted price. We returned home with our suitcases full of them! Perhaps that was the first time that the future Mr. True2Scale realized that his soon-to-be wife was a little obsessed with miniatures!